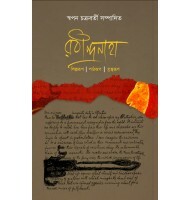 The publication of Bengali books has a history of more than two hundred and twenty five years. Our colonial inheritance and the construction of our modernity are integrally related to the history of print culture. It is nearly impossible to talk about our culture without any reference to the history and evolution of the printed books. 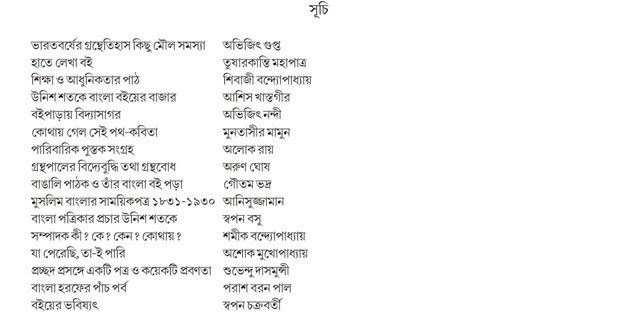 The contributors include Anisujjaman, Goutam Bhadra, Alok Roy, Shamik Bandopadhyay and Ashis Khastogir. DELHI VISWAVIDYALAY-ER NAROSINHA DAS PUROSKAR PRAPTO The publication of Bengali books has a history of more than two hundred and twenty five years. Our colonial inheritance and the construction of our modernity are integrally related to the history of print culture. It is nearly impossible to talk about our culture without any reference to the history and evolution of the printed books. 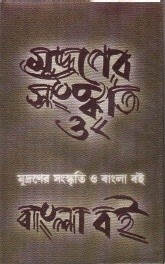 The contributors include Anisujjaman, Goutam Bhadra, Alok Roy, Shamik Bandopadhyay and Ashis Khastogir.